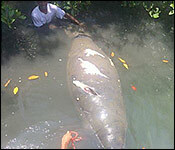 Register Log In AmbergrisCaye.com Home Forums Stann Creek Harvest Caye Contributing To Spike In Manatee Deaths? Could Harvest Caye Be Contributing To Spike In Placencia area Manatee Deaths? The Southern Environmental Association is reporting tonight that a manatee was killed in the Placencia Lagoon, and they believe that the increased traffic in the area is putting the endangered mammals at risk. SEA reports that they received a report yesterday morning of a dead manatee drifting in the Placencia Lagoon, near Malacate Beach. Their quick response team were dispatched, and their investigations have revealed that the manatee was hit by a catamaran named Lady Lisa on Tuesday evening. The catamaran's workers allegedly towed the manatee to a marina located on Norwegian Cruise Line's Harvest Caye. That female manatee was examined, and 3 distinct cut wounds from a boat propeller was found on its back. It was then hauled to another location in the lagoon for further examination. According to SEA, this is the 4th reported manatee death in the Placencia Lagoon since the beginning of 2017. That's an increase over last year's number, and they say that it may be due to the increased boat traffic in the area. And there certainly have been more boats passing that way, since NCL opened its Harvest Caye island getaway. SEA stresses that all boat captains need to practice safe boating, especially inside the Placencia Lagoon, since this waterway serves as a natural haven for manatees.